One of the most important challenges in FSS today is improving customer onboarding across digital channels. So how do you get there? With Digital Identity Trust solutions. Attend the IBM Trusteer Meetup to improve your understanding of digital identity trust and how it creates a smoother customer experience by balancing convenience and security while addressing compliance. Join us for insights on Spain’s 2018 fraud landscape from IBM threat experts and to learn how a digital identity trust strategy can help your organization. Discover use cases at FSS organizations like yours and how the cloud offers global threat intelligence and AI that keeps bad actors out. Meet FSS professionals like yourselves, who seek to innovate to reduce fraud and improve their business’ bottom line. We have scheduled this event to come immediately after the IBM Security Summit taking place that day. 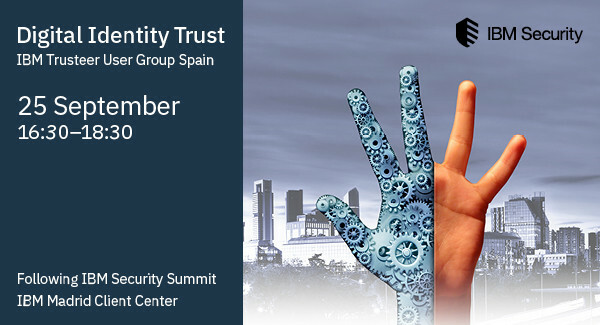 To register for the IBM Security Summit, click here. To register for the IBM Trusteer Meetup, contact Marta Alcántara. Any attendee to the IBM Security Summit is welcome to attend the Trusteer event. Alternatively, you are welcome to attend the Trusteer event only. We look forward to seeing you on Sept. 25. IBM Trusteer offers a digital identity trust platform that helps identify new and trusted customers and protect against payment fraud across an end user’s omnichannel journey. It supports more than 500 organizations worldwide and handles more than 40 billion application access instances and one billion user sessions per month. At IBM Trusteer, we strongly believe that building digital trust into your strategy is key to contributing to your business’s digital growth.